Zhongwei is a desert oasis lying in the central part of Ningxia Hui Autonomous Region, bordering Gansu Province to the west and Inner Mongolia to the north. It covers an area of 14,755 square kilometers. Of 1.14 million population, the Hui ethnic group accounts for approximately 31.5%. The terrain of Zhongwei declines from the west to the east, and from the south to the north. Mountains and loess hills constitute most of the territory. Desert, alluvial plains, terraces, mountains and basins are the main landforms. The Yellow River flows through the northwestern part of the city. Zhongwei has rich mineral resources such as gypsum, silica, coal, clay, and limestone. Reserves of gypsum, clay and coal amount to approximately 7 billion tons, 5 billion tons and 1.2 billion tons, respectively. 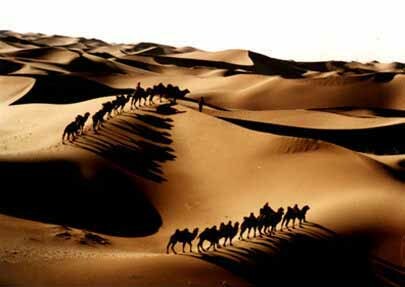 It is a tourist city due to its gorgeous desert landscape. Top attractions include the Shapotou Tourism and Scenic Desert Area, and Gao Miao, a temple where Confucian, Buddhist, and Taoist ceremonies were once held. Zhongwei is considered to be the Chinese hometown of medlar, which is edible raw or cooked and plays an important role in traditional Chinese medicine. Other special local products include watermelon, pear, apple, yellow wine, and golden thread jujube. The area has a semi-arid continental monsoon climate and is subject to sand storms. Its climate features a late spring, a short summer and a long winter. The average temperature is 7.3-9.5°C. Transportation in Zhongwei is very convenient. Zhongwei Airport, 26 km from Shapotou Tourism and Scenic Desert Area, offers flights to major cities including Beijing, Yinchuan, Xi'an, and Lanzhou.